“A few years ago, these rums [Zacapa and Diplo Res Ex] were seen as the baseline for all other rums to be judged. No longer.” Thus wrote Wes Burgin over at the Fat Rum Pirate in an excellent July 2017 post suggesting that with social media and education, enthusiasts were becoming more knowledgeable and less apt to accept adulterated rums than ever before. Yet in spite of that ideal, in spite of the ever-expanding knowledge-base of rums the world over, the Diplo remains enormously popular. It’s unlikely that there’s any rum drinker out there – junkie or not – who didn’t at some point have a fling with this plump Venezuelan señora. Just about all rum writers have done a thing on it. Like the Bacardis, El Dorados and Zacapas, it’s one of those rums one can find just about anywhere, and for the new people coming to rum cold, it remains a staple, if not always a favourite. That is, of course, due to both its very affordable price, and because of is sweet placidity. You don’t want expensive indie aggro? A light, easy-going drink? Something to relax with? Complex enough for Government work? No thinking required? Here’s your solution. That’s also the reason why it drops off the radar of those people who grow to take their rums seriously (if it doesn’t drive them into transports of righteous rage). Diplomatico – marketed as Botucal in Germany, named after one of the farms from which the cane comes, though it’s exactly the same product – never bothered to punch it up, never worried about cask strength, never deigned to lose the dosing or adulteration, and sells briskly day in and day out. The deep-diving rum chums just shake their heads and head for the exits to buy the latest indie casker, and discussions on Facebook about the matter are more likely than any other to end up in verbal fisticuffs. Yet consider for a moment the page of this rum in the populist-driven, crowd-sourced “review” site RumRatings. A top-end, well-known, mid-priced unadulterated rum issued at full proof like, say, the Foursquare Criterion has 13 ratings on that site. The Triptych has 11. The 2006 10 Year Old has 4, and the most popular Foursquare rum is the 9 year old 2005 Port Cask Finish with 71. The Diplomatico in contrast has over 1,200, with most rating it between 8 and 9 out of 10 points. Surely neither longevity, nor rank please-as-many-as-possible populism are solely responsible for such a disparity. There’s got to be more to it than just that, a reason why it regularly appears on people’s answers to the constant question “What to start with?” — and I’m sorry but not everyone drinks a few hundred rums a year like us writers and festival junkies, and it isn’t enough to simply shrug, sniff condescendingly and say “some people just don’t know good rums.” If it is – as I suggest – a rum worth revisiting, then such popularity and esteem requires a cold, beady-eyed re-consideration. We have to understand whether it has something more in its trousers, something subtle, that excites that kind of appreciation. It was in an effort to understand what lay behind the popularity of the Diplo that I deliberately sourced a bottle in Berlin in late 2017, and while my controls were a few stronger, purer rums from the Latin side, to my surprise the Diplo didn’t entirely choke even when ranked against them (I shall now pause for the incredulous expressions of indignation to pass), though for sure it never came close to exceeding any and raced to the bottom in fine style. Part of all this is its relative simplicity compared to fierce and pungent rums now taking centre stage. The nose was a straightforward sweet toblerone, toffee, vanilla, butterscotch and caramel, very light and easy and butter-smooth, with what complexity there was being imparted by spices aimed at the sweet side – rosemary, cinnamon, nutmeg – and a little nuttiness, and a hint of light fruit, all of which took real effort to separate out. Hardly the most complex or intriguing smell ever to waft out of a rum bottle, and the vanilla and caramel were really too dominant to provide the sort of excellence the maker trumpets for itself. Similar issues affect the palate. Smooth – yes, warm – yes, comfortable – undoubtedly. There was a little oak mixing things up here, but mostly the taste was muscovado sugar and caramel, vanilla, light fruits of indeterminate nature, and those same spices from the nose (cinnamon being at the forefront) with nothing particularly new or adventurous leading one into undiscovered territory. Overall, even on the finish, and then judged overall, it had little beyond a pleasant, warm sort of sweet unaggressive nature only marginally redeemed by a light tart fruity note here or there, and the edge imparted by a little oak. Beyond that, it was way too sweet for my palate as it stands right now, and in conjunction with the controls it actually sinks even further because the dampening effect of the additions becomes self evident. So, that adulteration. It’s been measured at 30-40 g/L of whatever-it-is, which puts it in the same league as The El Dorado 12 and 15, Rum Nation Millonario and the Cartavio XO, all of which, back in the day, I enjoyed, and all of which have subsequently slipped in my estimation in the years between then and now, and been relegated to what I refer to as “dessert rums.” But what exactly are they adding to their rum? Back in 2010 when I wrote my original unscored review, the Distilleries Unidas website made tangential mention of flavouring additives (“Only…rich aromas and flavours are used to manufacture rums…” — this comment no longer appears); and Rob Burr remarked on the 2012 Inuakena review that a Venezuelan rum liqueur called Haciendo Saruro is added to the blend, but without corroboration (it was assumed he was speaking from insider knowledge). So I think we can take it as a given that it’s been tarted up, and it’s up to each person who tries this rum to make up their own minds as to what that means to them. Personally, I no longer care much for the Diplomatico and its ilk. It presents no real challenge. It simply isn’t interesting enough and is too sweet and easy. That, however, obscures the key point that people like it precisely for those reasons. It sells well not in spite of these deficiencies (as they are, to me), but because of them…because the majority of drinkers consider these very same drawbacks as points of distinction, and if you doubt that and the unkillability of sweet, check out the hundreds of comments in response to “Don’t treat people like snobs because they like sweet rums” post on FB in December 2017. Since I’m not arrogant enough to believe that my tastes and my palate matter more, or should take precedence over others, I can simply suggest that people try more rums to get a feel for more profiles before praising it to the high heavens as some kind of ur-rum of the Spanish style. Let us also concede that a rum like this has its place. On the negative side are all the issues raised above. On the plus side of the ledger, for those who like these things, there is sweetness, smoothness and a stab at complexity. It works fabulously as a standalone sipping drink when concentration and thought is not desired or required. It’s not entirely an over-sugared mess like, oh, the A.H. Riise Navy rum. It makes a decent introduction to neat rums for those raised on over-spiced, over-flavoured rums or who came up through the ranks trying rums like Kraken, Captain Morgan, Sailor Jerry or Don Papa. As one of the first steps in the world of rum, this ron remains a tough one to beat, and that’s why it should be on the list of anyone who is assembling the first home bar, and should be considered, for good or ill, one of the Key Rums of the World…even if, sooner or later, all true rum fans will inevitably move beyond it. A puzzlingly schizophrenic rum – I can’t quite make up my mind about how good it is: an undistinguished bottle containing a so-so tasting rum with both a lovely nose and a finish to savour. I’m going to go back to this one, for sure, just to nail my opinion down more precisely. The Diplomatico Anejo I had on the night of the last Liquorature club was one of those weird rums that I couldn’t quite categorize, because it had both good elements I liked and others by which I wasn’t entirely enthralled. However, I had quite a bit of it, so who’s to say that’s a bad thing? Presented to Liquorature by the same gent who introduced us to the 15 year old Diplomatico Gran Reserva, the Anejo is distilled by the same Venezuelan concern that makes that version – this was merely a younger iteration, having no age statement on the bottle. It also had the rather grandiose statement that it was the Rare Rum of the Caribbean on it, and as a member of the Caribbean diaspora myself, I can tell you that there’s a misnomer if I ever heard one, since not only are there no shortages of rums (rare or otherwise) in the area, but Venezuela, while having a fairly extensive Caribbean beachfront, is not considered culturally a part of De Islands, being more akin to Latin America. I mean, when was the last time you ever heard of a Venezuelan soca competition, a Veno steel pan band, or their local cricket team? Bottle appearance? Utterly average, nothing fancy – solidly seated plastic cap, though, which I liked (at least it wasn’t some cheap tinfoil screw-on). The Hippie stayed silent on this one (remember his childish exuberance with the postage stamp design of the Gran Reserva?) but did partake of a nip or two. Nose was soft, a little fruity – peaches and soft fleshy types, with a bananas hint emerging reluctantly after a bit; and a vanilla scent which I liked. Not much in the way of a sting to your snoot, so you’d probably like this one on that level alone. No real complexity there, though. I said the bottle appearance was utterly average. The taste, to me, was medium everything. Like Bacardi, it excelled at nothing while being average at everything. It’s almost like the Corolla or Civic of rums. I mean, there was almost nothing out of the ordinary for which to award points or deduct them – the body was medium; the taste was sweet, but not too much so, with neutral smoothness, a taste that lingered on, not too short, not too long, and which had a slightly thicker character that (I swear) tasted of unsweetened chocolate; and there was an odd briny note, a tang of the sea, that I found odd but in no ways unpleasant. If I was indifferent to the appearance and taste, let me wax somewhat more ebullient on the fade, which was excellent. Soft; smooth, elegant, long lasting. A taste of grapes a little ripe but not as cloying as the Legendario’s muscatel reek, wafted up and stayed in the mind. On occasion, I’ve been given a hard time by mon pere for not always expressing an unequivocal opinion (he really must love Ebert’s thumb, honestly), and rereading the above I see I’ve done it again. So here goes: I think this is a surprisingly good rum, with elements that make me believe the blender wasn’t too sure what he wanted. I’d mix it or sip it (the latter perhaps with a cube of ice), but what it really makes me want to do is go back to the Gran Reserva: I didn’t have a rating system when I reviewed it back then, but the good and bad of this lower-tiered product from Venezuela makes me want to return and give the other one a more thorough evaluation. First posted 9th March 2010 on Liquorature. For some reason, the Last Hippie was absolutely enthralled by the label design* of this Venezuelan import when Pat trotted it out for the February 2010 get-together, rhapsodically comparing it to a postage stamp, nearly swooning over the originality of it all. It was the first time I ever saw a label nearly bring a Peathead over to the Light and have a shot of the good stuff, but it fell just short of the mark, alas and perhaps embarassed by his untoward display of emotion, he retreated to the other scottish brews for the rest of the night. 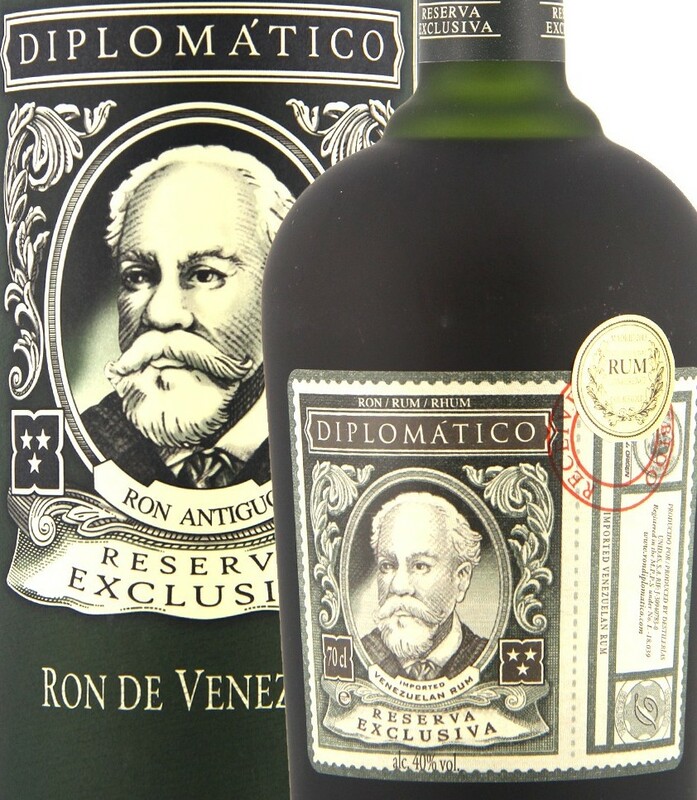 Diplomatica Exclusiva Reserva is a premium aged rum – indeed, the top of the line – made by the Venezuelan firm of Destilerias Unidas…which is now privately held, and a major supplier of raw spirit stock to Seagram. The research is unclear: either one of the original owners, or Seagram, built a factory in the small town of la Miel, close to the Columbian border, in the 1950s, was for many years the only factor in northern SA and the Caribbean to make both cane and grain based spirits: even now, this one factory makes whiskeys, vodkas, liquers, gin…and Smirnoff Ice. (Looking at the location on the map, one wonders why it had to be so remote…I mean, this town is really far away from anything). Interestingly, the blend is made from a combination of heavy pot-still rum (80%) and column still rum (20%). The rums are separately aged in white-oak barrels and then blended together to produce the final product which is a rich and textured dark rum of admirable complexity and taste for the modest price. The website also makes tangential mention of flavouring additives (“Only … rich aromas and flavours are used to manufacture rums…”) which statement I include for completeness, and to contrast it against the majority of rum producers who couldn’t be bothered (to their detriment, I think). The nearly opaque bottle effectively disguises a copper-brown coloured rum that is medium-heavy bodied and of middle density, and with a distinctive taste. The caramel and vanilla notes on the nose mellow gently into a very nice taste of burnt sugar, sweet molasses (not much), perhaps cream soda and…butterscotch. And yet, it’s not overly sweet either. Very slightly ‘oily’, leading to a long, semi-sweet finish that everyone who tried liked. Definitely top tier stuff, and fully desrving to be had without embellishment of any kind. Which is not to say it can’t be used as a mixer but it doesn’t need to be. The label is a portrait of Mr. Don Juancho Nieto Melendez de Hacienda Botucal, a famous Venezuelan historical personage (and of impeccably ancient Iberian lineage) who acted as an ambassador for Venzuelan spirits in the 19th century, and noted as a collector of top-shelf liquors of all kinds. If my translation of the spanish web page is right, it was he who encouraged the making of spirits from the area around la Miel, because of the naturally filtered water, and the high quality of sugar cane grown there. In 2017, after a re-tasting and re-evaluation, I called the Diplo Res Ex of the Key Rums of the World.